Life is deliciously full at the moment! Amongst other things, I am pleased to announce that I will be demonstrating on a regular basis at Freshwater Bay House to those attending HF Holidays. Such lovely people and it’s great fun to be part of their holiday over to the Isle of Wight. Not only that, the views from the hotel are stunning. 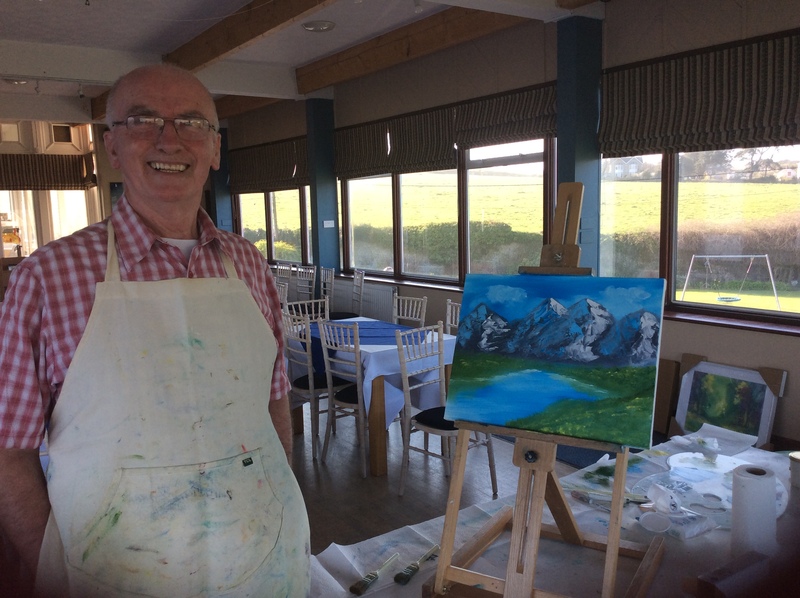 The gentleman in the photo was the first art student to give painting a go following the demonstration – he’d never painted before but produced a vibrant and life-like painting much to our delight. With June fast approaching, preparations for the Residential Painting Holiday in Southern France are underway and I can’t wait to take the group over to such a beautiful environment with the excellent service, food and accommodation provided at the villa. There are a couple of spots left for those interested and if you’re travelling alone and wish to have company, we can soon put you in touch with those travelling over from the UK too. I will of course be posting regular photos to Facebook on all events – in the meantime, happy painting.